This article was written by Micheal Miles. I read it in 2012 and really like it. You may get his new book 'Thirty Days to Change Your Life' and support him by clicking here. Who’s in control of your life? Who’s pulling your strings? For the majority of us, it’s other people – society, colleagues, friends, family or our religious community. We learned this way of operating when we were very young, of course. We were brainwashed. We discovered that feeling important and feeling accepted was a nice experience and so we learned to do everything we could to make other people like us. We didn’t want to be singled out by the crowd for being different because this wasn’t such a nice feeling. We learned this way of being so well that, as adults, we continue – mostly through mutual peer pressure – to keep each other in check. Like sheep without any need for a sheepdog, we keep each other in line. It works both ways. First, we are afraid of disapproval. Am I dressed right? Will people laugh at my accent? Will I look stupid? Will I make a mistake? When we feel that others think badly of us, it makes us feel bad and so we try to avoid this. Second, we all want to feel important and so we crave the positive attention of others. This is one of our basic needs, according to Dale Carnegie, author of the multi-million best seller, How to Win Friends and Influence People. And so when people stroke our ego and tell us how wonderful we are, it makes us feel good. We crave this good feeling like a drug – we are addicted to it and seek it out wherever we can. We are so desperate for the approval of others that we live unhappy and limited lives, denying huge swathes of ourselves and failing to do the things we really want to do because we’re worried about what other people will think. Just as drug addicts and alcoholics live impoverished lives to keep getting their fix, so we impoverish our own existence to get our own constant fix of approval. The drug is so addictive that most people will not give it up – they will keep looking for approval because the hit is so intense. But, just as with any drug, there is a price to pay. The price of the approval drug is freedom – the freedom to be ourselves. Do you want your drug or do you want to be free? You cannot have both. If you want to pull your own strings, you need to stop giving away your power – you need to genuinely stop caring what other people think about you. The truth is that it’s all an illusion anyway – you cannot control what other people think. People have their own agenda, they come with their own baggage and, in the end, they’re more interested in themselves than in you; in fact, they’re thinking about themselves ‘morning, noon and after dinner,’ as Carnegie wrote. If we try to live by the opinions of others, we will build our life on sinking sand. Everyone has a different way of thinking, and people change their opinions all the time. The person who tries to please everyone will only end up getting exhausted and probably pleasing no one in the process. So how can we take back control? If we are truly ready to give up the drug of approval and importance (which most people are not), I think there’s only one way – make a conscious decision to stop caring what other people think. This doesn’t mean that you should start to treat people badly, step on them or use them. Why would it? I read somewhere recently that the world would be terrible if nobody cared what other people thought of them. But why so? We all know what’s right and wrong. I have written before about guiding your life by means of a set of values – not values imposed from the outside by others, but innate values which come from within. If we are driven by these values and not by the changing opinions and value systems of others, we will live a more authentic, effective, purposeful and happy life. We will be actualized and successful. Only one question remains – do you really want to be free? As we explained on the course In the UK disabled people refer to themselves as 'disabled people' reflecting the social model of disability where society disables people by not creating an accessible environment (e.g. lack of captioning or ramps or accessible web design). They don't like the US term 'people with disabilities' as this reflects the medical model where society has no responsibility for the disability. I don't generally post feedback about courses (UK equivalent: modules) I take in college, but this one course was one of my favourites. That is because I really learned something I didn't really know existed before. COMP6219 - Designing Usable and Accessible Technologies is a course taught at the graduate (UK equivalent: postgraduate) level in the world-renowned Faculty of Physical Sciences and Engineering at the University of Southampton. I am a webmaster and have designed websites for 5+ years but I have was never building a website and thought like 'Would a person with a disability be able to access this website?'. And this course is designed to exactly be able to answer this question. I never knew 'accessibility' was a topic for designing website and mobiles applications. And this course will teach you everything about that topic, from A to Z. It starts from explaining an overview of accessibility and usability, then it talks about universal accessibility and usability standards (mainly WCAG 2.0). During the module, you are also taught how to create personas and later on thought how to evaluate websites and software applications for accessibility and usability. Frameworks are explained and examples in the lab are demonstrated. Other topics include 'business case for accessibility', 'accessibility and mobile technologies', 'designing for adoption' and 'open source development'. You are evaluated with coursework and not exams. No - seriously, I couldn't be happier. If exams were to be made, it would probably be memorising slides and cramming information to vomit later on an exam paper and not learning anything in the process. 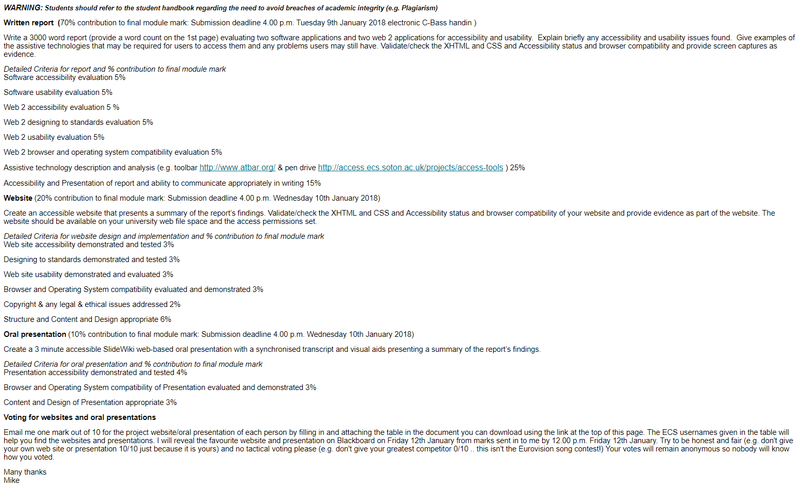 But instead, we are evaluated by one huge coursework which is due at the end of the semester. Non-boring (at least for me), any topic about the web excites me. The lectures are filled with videos, websites which sometimes are checked on the spot and are generally interactive. The lecturers don't rely on the slides alone to explain and transfer ideas so you are less likely to be bored. Testimonials, examples, websites, and other educational material were shown in class. The module has three lecturers and not just one. Sometimes the three lecturers are present in the class which dramatically improved the learning experience. Not strict about laptop or cellphone use. Usually, no one is especially at the graduate level which is good. Slide Wiki: we are not allowed to use other than SlideWiki to make the slides. But SlideWiki, went down on several occasions. There was a time where I was a saving a slide and an error popped up saying 'Error 403: Service Unavailable'. I feel the site is suffering from a 'management' issue. It is also very hard to make slides on that website, and it fails to auto-save. Sometimes the instructors refer to people with disabilities as 'disabled people'. It might offend some. It would be better if they use more sensitive wording such as 'people with disabilities' instead. Word limitations were really destructive for me. 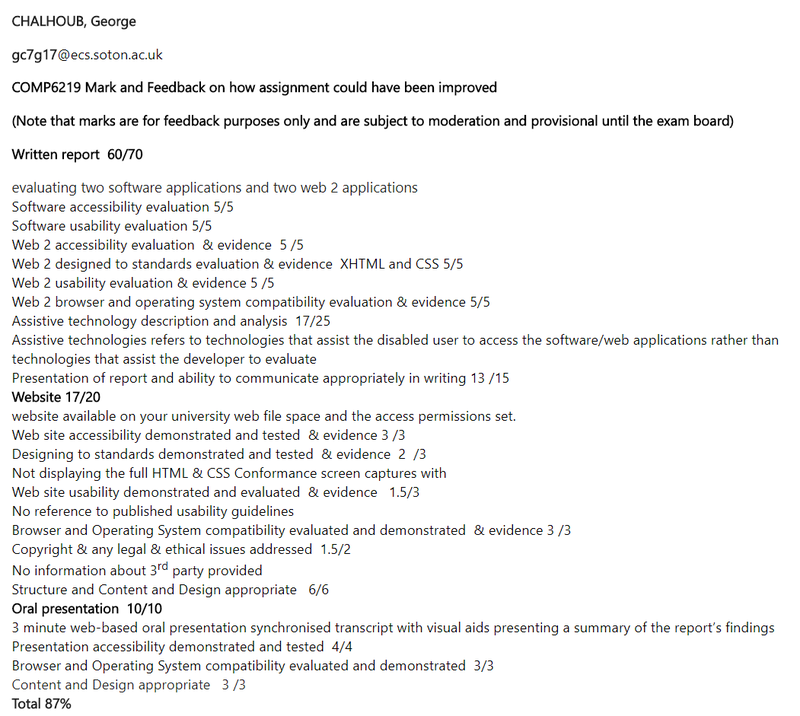 At the end of the semester, we have to produce a report where we evaluate four applications for accessibility and usability and other factors affecting them. We are only allowed to do that in 3,000 words which is too low for me. In my undergraduate university, the instructor used to tell me 'the limit is the sky' but here in the UK it is different. There are word limitations you have to follow. In my assignment, I had to remove a lot of information to reduce the word 3,100 words. The assignment could have made a bit clearer. For example, we are asked about 'assistive technology description and analysis', but it is not really made clear what or how should we analyse. I do understand, that assignments can't be too explicit about some things to require us to research more but some questions aren't clear like the assistive technology one. Reusing Microsoft Office: It brought back my old Microsoft Office memories. I broke up with Microsoft Office in 2014 and was using Google Docs for 3 years. I denounced Microsoft Office as a failing product but this time I've had to use it to write the report because it has more accessibility features and an accessibility checker which is something lacking from Google Docs. The product remains awful with a weak integration with OneDrive. I lost one night's work one time because of Microsoft Office and had to redo it. Applications to pick: I had no idea what to evaluate but I wanted applications that are different so I went with: Reddit and Steam (for web), and VLC and Norton Internet Security (for web). Time: The assignment was really time-consuming; especially if you like things to be perfect. It took a lot to build that website (despite having a template) and the presentation took a lot of time as well. Standards: Didn't know if my work was enough or not. Microsoft Edge has a good accessibility checker. I was really surprised about that and never thought Microsoft would bring such good feature in their mediocre new browser Edge. Accessibility is generally ignored and most webmasters don't give a damn about making their site accessible (I didn't even know that was a thing). Governments such as UK and US have to put laws sometimes to force websites to comply. 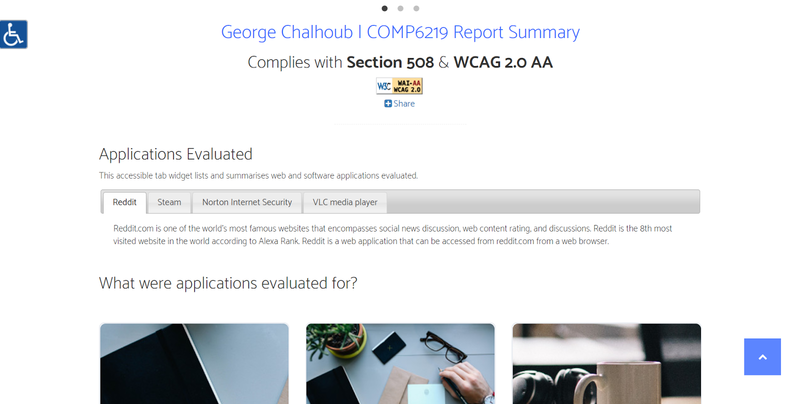 All of Web Content Accessibility Guidelines (WCAG) 2.0 in detail. Personas, how to make them and what they mean. That SlideWiki exists. Learned how to use it, but really that wasn't hard. All web accessibility tools aren't completely accurate and can't be accurate. Human intervention is needed. They are basically a script written by a human being. Many people in the world today have disabilities. Having said that, it is important that you feel an ethical obligation to make your website accessible to them. In the same way that you make toilets accessible in the UK or US, you should make accessible websites. Basics of WAI Aria which is a "technical specification that provides a framework to improve the accessibility and interoperability of web content and applications". Generally, how to make websites accessible according to standards. There is a lot more to research, improve and innovate in this field. For the third time in a row, Apple has provided a solution for my iPhone problem for free. The problem with my beloved iPhone 7 started when I upgraded to iOS 8. That moment, the Home Button stopped working. The rest is history. Once my home button got broken, I took it to the Apple Store in Southampton and was furious; and the Apple guru said that this is a hardware problem. I was puzzled, and I told him 'that is not reasonable since it stopped working after I upgraded to iOS 8'; however, the apple guru responded with 'it is a coincidence'. 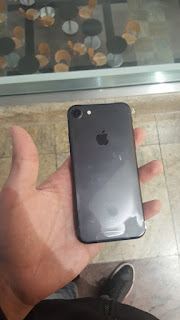 Eventually, Apple Store was able to fix my phone by replacing it with both a new screen and a new home button. You can't replace only the home button since it seems to all come within one piece. However, that repair was free because my iPhone was under warranty. The other issue started when I was in Lebanon, and my iPhone's screen decided to stop working. It kept on blacking out and showing weird colours until the screen stopped working entirely. But at that point, my iPhone's warranty had already expired, so I thought I had to pay for the repair. However, the Apple Guru informed me that the screen they replaced not too long ago is still under the 90-days warranty. And he informed that the repair would be free. 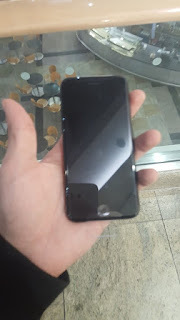 I was really happy, and I was asked to come a few hours later to pick up my phone since the repair is done on the same day. When I got back later, another Apple Guru came to me and informed that the issue with my screen being completely black persisted even with a new changed screen, and then I thought 'I was really f*cked' until the Apple Guru handed me a new iPhone 7 black and apologised for not being able to fix my phone. 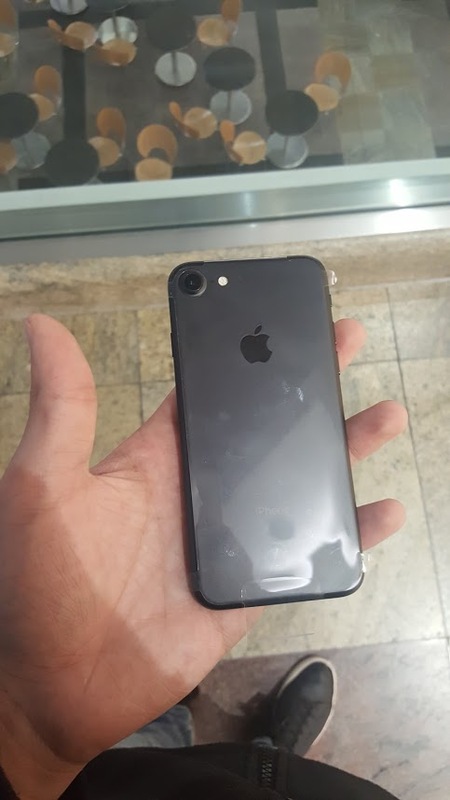 The Apple Guru informed me that since the screen was still under warranty, I have to pay nothing and here I am with a new iPhone 7! They took the broken iPhone but luckily it was backed up entirely to the iCloud so all my data, photos and phone settings would transfer to the new iPhone. Thank you Apple for your professionalism and phenomenal customer support.